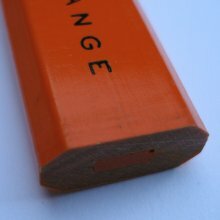 The International Arrivals pencils – fluorescent and carpenter – have no practical way to sharpen them. A lucky break came my way, and I found the right sharpener at a local bookstore – a place with no other International Arrivals products that I could see. 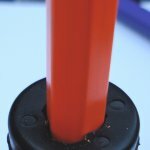 Much larger than just a general large hole sharpener, with slots specifically sized for their two pencils, the product brings some resolution to the problem. 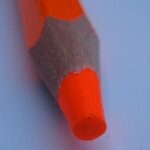 The oversize fluorescent pencils are made usable again – and the carpenter’s pencil is pointed. Of course, this point is like that of a regular pencil, and discards the lead’s rectangular shape. Who wants carpenter pencils pointed this way? I suppose it beats nothing. 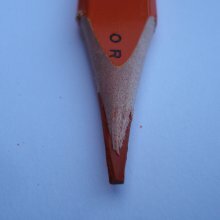 Hmmmm, yes…sharpening ones carpenters pencil to an ordinary round conical point kind of defeats half the purpose of a carpenters pencil. 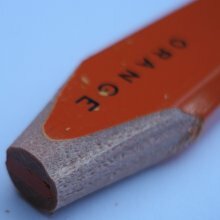 Hi Stephen, what about General’s Flat Point Sharpener? Wouldn’t that be practical at least for the International Arrivals carpenter pencil? I live in Madrid Spain, I often travel to U.S. please I would like information about your pencils, I am very interested with the arpenter pencils colours. Steve nailed it. 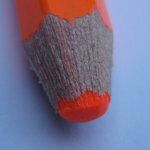 Carpenters nearly always have a utility knife in their belt/pocket and use that to sharpen their pencils. Four quick swipes of the blade. As for the rectangular shape, you need only to run a normal pencil across rough porous materials like plywood, OSB, or concrete to see how fast the lead breaks. Often. Very often. Enough that you curse and chuck that round pencil and look *again* for that *&#% carpenters pencil you can’t find in your toolbox. Even if one manages to write on rough surfaces and not break the lead on a normal pencil, it gets worn down really fast. Meaning you have to sharpen more often. With your utility knife. 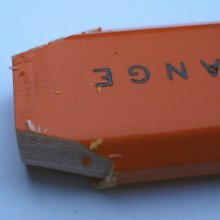 Perhaps the carpenters pencil is flat/rectangular so it won’t roll off the roof. I have another theory. An oversized round pencil won’t stay on a carpenters favored pencil holder, his ear.